Celebrating the life of George Moore, Jr.
Be the first to share your favorite memory, photo or story of George . This memorial page is dedicated for family, friends and future generations to celebrate the life of their loved one. 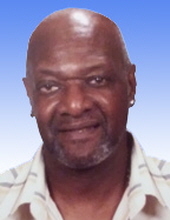 Obituary for George Moore, Jr.
George Moore, Jr. was born on December 11, 1948 in Hardeesville, South Carolina to the late George Moore and Jannie Ford Moore. He spent his early childhood in Hardeesville and eventually relocated to Jersey City, New Jersey. He attended Ferris High School in Jersey City, New Jersey. After high school, George worked for Robart Wood & Wire Company for 5 years, and Port Jersey Distribution Center in Jersey City for 24 years. He retired from Forever Cheese in Secaucus, New Jersey after 15 years of service. George also worked for the City of Linden as a School Crossing Guard for 2 years. In 1970, George married the love of his life Irene Posey and became partners in life for 48 years. They had two children, Tyrell and Kimberly. George had a special talent. He was a professional drummer for 15 years with several bands and groups. He was a die-hard New York Giants’ Fan. George also loved race cars and built one known as "THINK TWICE." He was a loving father and a doting dedicated grandfather. George loved his family dearly and always showed it. His grandson Ayden calls him a LEGEND. He had a very friendly personality and would talk to anybody about anything. On Friday, February 1, 2019, George Moore, Jr. departed from this life at Beth Israel Hospital in Newark. George leaves to cherish his memories his wife, Irene Moore; son, Tyrell; daughter, Kimberly Moore and daughter in-law, Tiffany; two brothers: Ronald Moore and Anthony Moore; two sisters: Verline Johnson and DebraAnn Dew; 7 grandchildren: Zyshonne Small, Tylayja Moore, Zaniya Small, Elijah Harrison, Giana Anglin, Tyrell Moore, Jr. and Ayden Moore; and a host of aunts, uncles, nieces, nephews, cousins and friends. To send flowers or a remembrance gift to the family of George Moore, Jr., please visit our Tribute Store. "Email Address" would like to share the life celebration of George Moore, Jr.. Click on the "link" to go to share a favorite memory or leave a condolence message for the family.